07/11/2012: We're out for now!! Thanks to all that requested one of our NFC signs they will be shipping shortly. You're not out of luck though - follow us on Facebook we'll be giving away NFC social tag keychains next - STAY TUNED! We're looking for a few hip retail businesses to try out our new NFC enabled signs. All you have to do to qualify is have a retail store, create a Voxini profile (5 minutes) and let us know what you think. 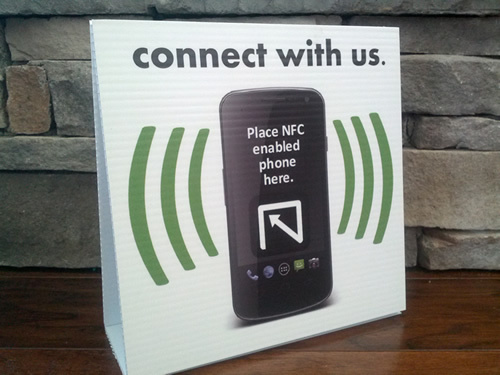 We'll program your NFC enabled counter sign to display your available social media profiles and mail it your way. Supplies are limited for free NFC signs and available in the U.S. only at this time. We'll select up to 20 businesses per day for free signs and contact you with details if selected.